Continuing my last post „Finding the perfect vintage glasses“ I now speak of my experience of finally visiting Lunettes, a vintage eyewear shop in Berlin, and show you my new beautiful frame I found there. Die deutsche Version des Beitrags findest du hier: Schatzsuche bei Lunettes Selection Berlin. Glasses can give a person a completely new look, a special style or exceptional appearance. They determine the way people see you, interpret your character, even your qualities. And they can have a big influence on your self-confindence. For a long time now I was looking for a pair of lovely glasses. I wanted a frame that would match my every day life, my look, which is mostly inspired by 1940s fashion. My goal was to find a beautiful, authentic pair of glasses and at the same time to take a break from contacts, which I wore for years. So I was very lucky when recently the vintage eyewear shop Lunettes contacted me and offered help for finding the right pair. At the end of the last year we finally went to Berlin and visited this unique store in the heart of the capital. 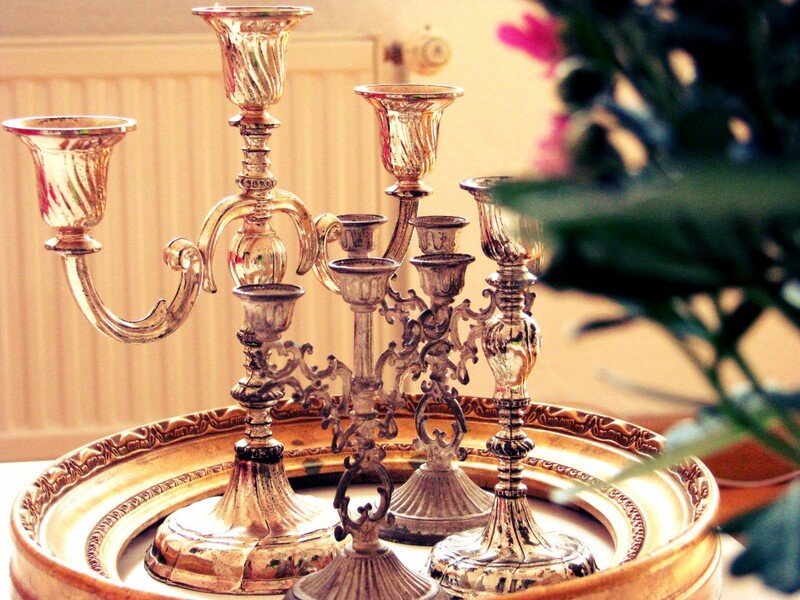 Let me share my experience with you and show you, which wonderful piece came home with me. 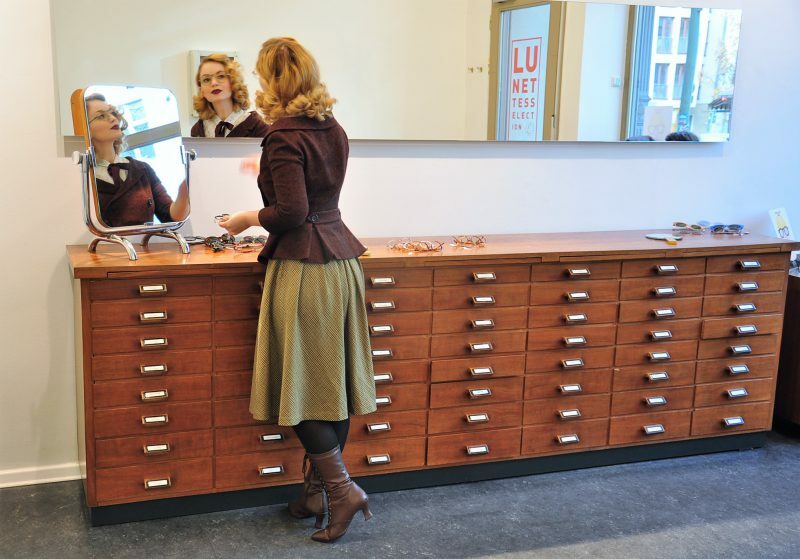 Lunettes is located at two places in Berlin- Berlin Mitte and Prenzlauer Berg. 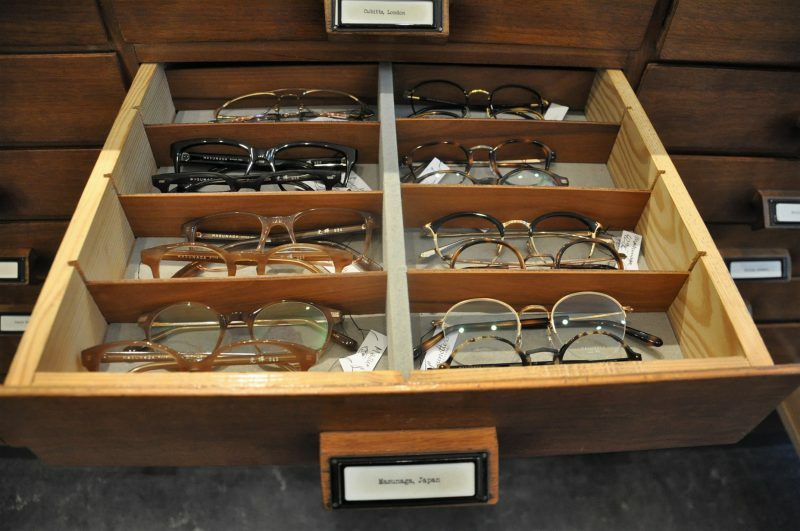 Both stores offer a wide range of antique spectacles and even vintage deadstock glasses, as well as frames from their own collection called „Lunettes Kollektion“. Their own glasses collections combine shapes from the past decades and got the lovely name of „a modern archive of eyewear“. Lunettes was one of the first eyewear shops that offered online shopping for glasses. You can order up to six pieces and try them at home. But of course it is also a wonderful experience to shop glasses the traditional way. The shop in Berlin Mitte is a quite familiar and small one, dominated by the large wooden cabinet, which holds all the vintage and retro treasures. Opening the drawers is like opening lucky bags – while one drawer contains some edgy, big and colourful 1980s sunglasses, another one surprises with some beautiful and delicate vintage metal frames. On this day I have also been wearing one of my favourite looks this season. I paired the Notting Hill Jacket from Gracy Q with a vintage blouse, a Gracy Q satin bow, a vintage skirt and some Victorian inspired faux leather boots*. This jacket has a wonderful feminine shape and is perfect for skirts as well as wide and comfy pants. In my series about the Teddy Girls and their extraordinary 1950s styling I interpreted this piece in a very boyish and rebellious way. 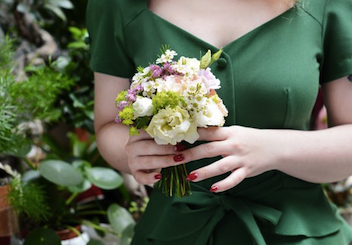 All these Teddy Girl inspired garments are on sale at the moment! Though there are many possibilities to shop glasses online, I still prefer being right at the source. At the vintage eyewear shop there are mostly much more pieces at a local shop than can be seen online. 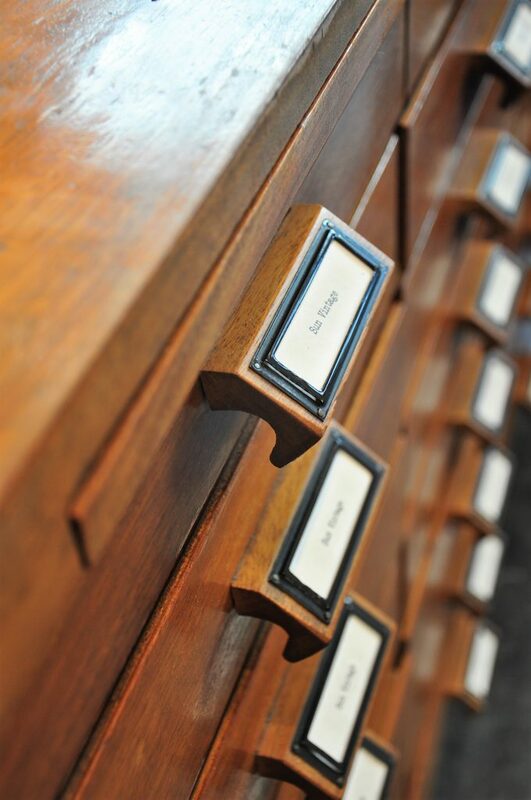 Apart from this, it such a joy to search through all the varieties of colours and shapes – from aviator, frameless or cateye glasses to heart shapes, excentric glasses with typewriter prints, or simple acetate, metal or celluloid pieces. 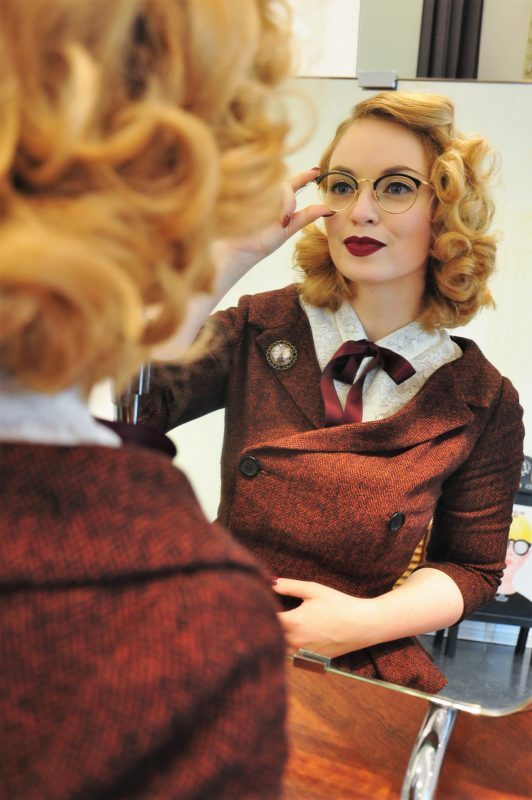 I know I mainly came to look for my own perfect pair of retro or vintage glasses, but we also spent some time browsing through their fascinating vintage collections and looking at glasses that I never had known that they exist. 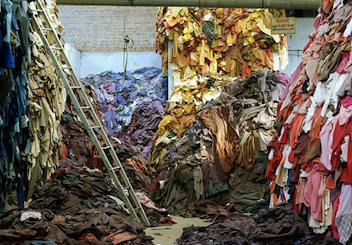 Like this piece below, which was made by the label Maske Berlin. The Germany-based label created frames that looked more like a piece of art than like a device to wear every day! Like many glasses this one above was made of acetate. 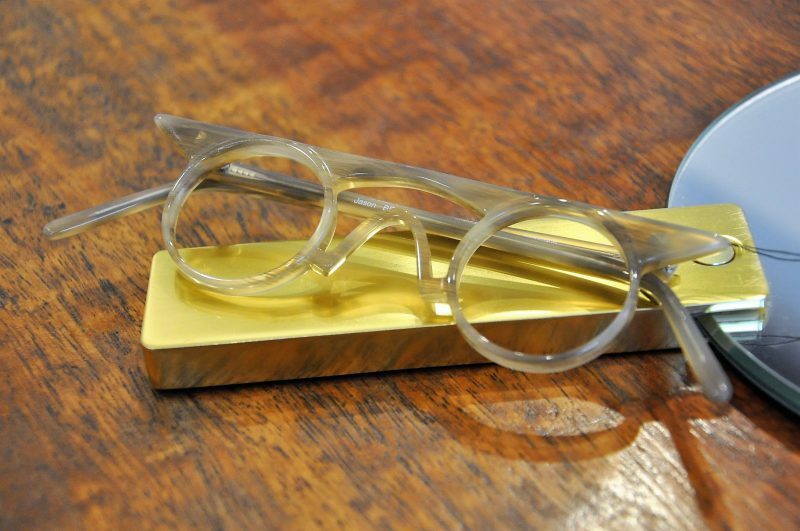 This material was first used in eyewear in the 1940s to replace other materials (such as tortoise shell). Acetate is very light, flexible and has a wide range in transparency and colour, so this is a quite popular material for frames – still today. In store I was told that some customers come to Lunettes to buy their glasses always from the same designers – glasses that one cannot get in every optician’s store or online. When I look at all these pieces I can absolutely understand them! 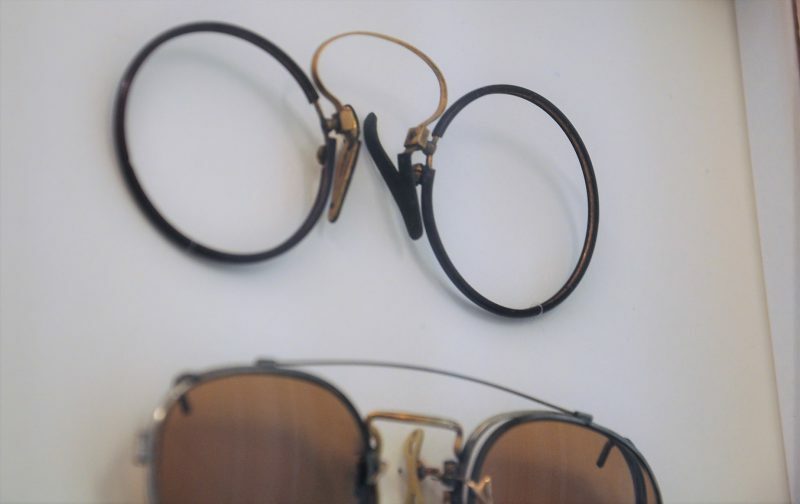 This pince-nez or in German „Zwicker“ – frame above is from the beginning of the 20th century. It was mainly used by men from the upper class. As these glasses do not have temples, they were clipped onto the nasal bridge. 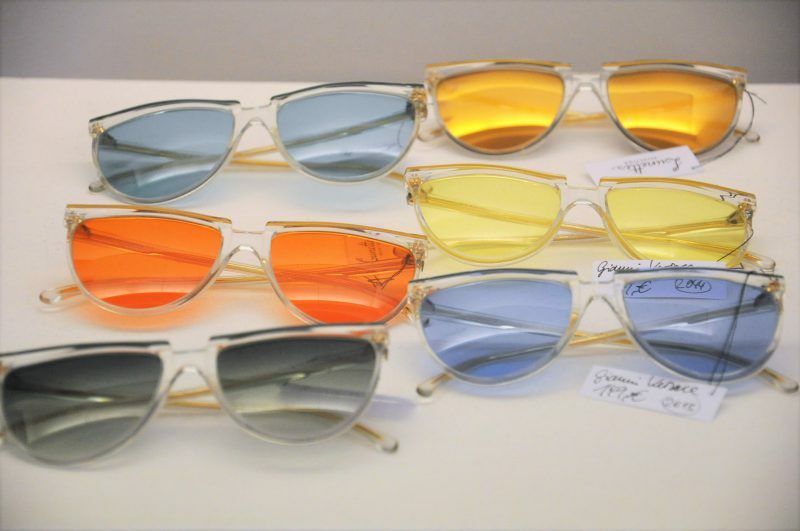 Below you see some colourful Gianni Versace sunglasses. 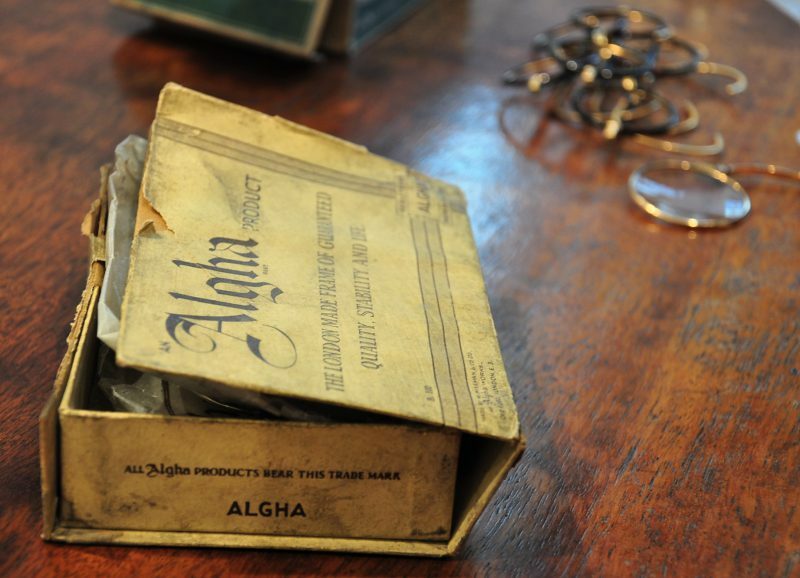 Some of the treasures Lunettes collects are even still in their original boxes, such as these 1930s Algha glasses below. This brand used to be a German one, befored it moved to London’s East End in 1932. Algha glasses have been worn by idols such as Eric Clapton or John Lennon. 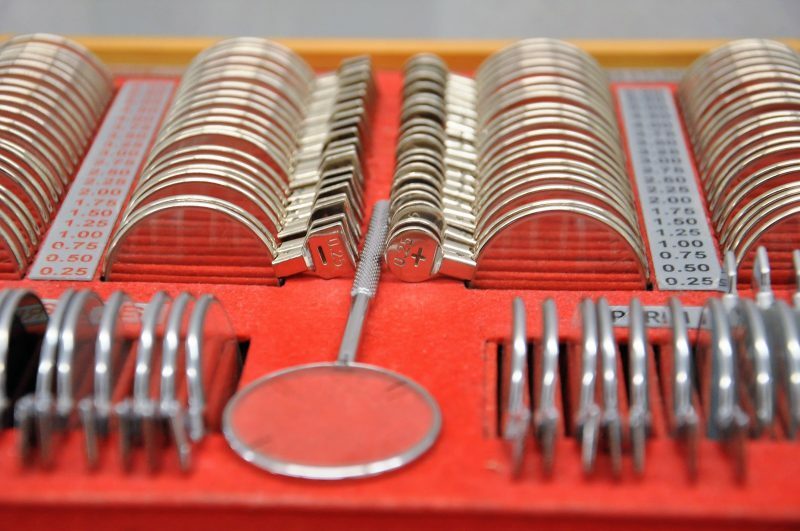 The traditional determination of refraction, which is still used by Lunettes in Berlin, is a very specific and detailed way to examine the eyesight. With the help of refraction glasses the optician cannot only find out the dioptres of each eye, but also for example the pupillary distance, the degree of astigmatism or the optical centre. This procedure takes place in a separate room at the shop. 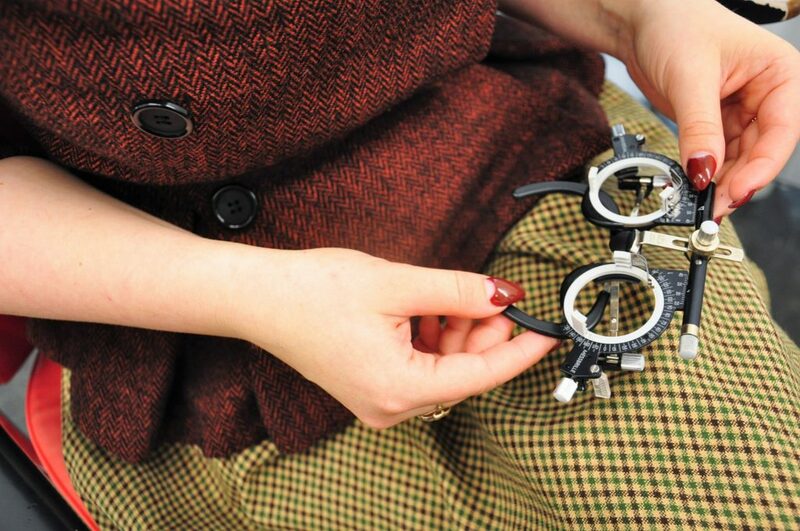 The optician uses and flips various lenses and asks „Which one is better – 1 or 2?“. I have known this method since my childhood, and I am sure you do as well, but today many opticians already replaced this system with modern techniques. I rather prefer this handmade method, it is like a puzzle that is slowly put together to find the perfect and individual sight. The optician puts the refraction glasses into the frame below. It took about half an hour to determine my exact eyesight. This is also an important aspect for choosing the right frame. When you have a very low number of dioptres and need thicker lenses, just like me, you also have to choose a frame that matches this size. Such a delicate metal frame, which I chose in my first post, does not work out for example. This lovely Herringbone jacket is from Gracy Q. A pair of glasses from a Japanese designer. I really liked them but did not want a black frame to dominate my face. Lunettes already sent me a variety of glasses to Leipzig so I could try some of them at home, just like they always do it with their online shop customers. I was quite sure I found the right pair and wanted to take it home, but at my visit in Berlin I noticed that my thicker lenses would not fit into the delicate metal frame. So together we browsed through their collections again. What you have to keep in mind when looking for the right frame I told you in my last post on buying vintage glasses. In the lower photo I am wearing the one pair that I finally chose. In the beginning it seems colourful and also the bridge is quite high. But I got used to it and really love these glasses. They match all of my looks, as well as my haircolour and my beloved dark red lipstick. And don’t they even look like the leopard fur of our Bengals? It is a very delicate and light frame, which was really important for me. I did not want the glasses to dominate my face. When I am wearing glasses, I still want the person face-to-face to be able to look into my eyes while speaking to me. And I want to feel comfortable, feel like I am totally being myself. What do you think of my choice? Choosing a pair of glasses is like choosing a companion. Looking for the guide, that will accompany my eyes for hopefully many years to come. Thank you Lunettes for finding me this wonderful piece! At Lunettes I learned, that glasses are not only a device to see clearly. Glasses have an incredibly fascinating long history, a huge and beautiful variety of shapes and colours, designers, artists – they can evoke passion and love, just as it does with their sellers in Berlin. If you would like to dive into this fascinating world of glasses, have a look at their international online shop or maybe you can even visit one of their stores in Berlin. I am sure that there is one unique frame that has been waiting for you. First shooting photos with my new glasses, taken by Crosslights Fotografie. The faux fur dress is from Topvintage. I think these glasses make the photos look even more authentic! More on their website or contact via info@lunettes-kollektion.com.